Fast, Reliable, High Quality Blueprinting & Friendly Service! From black/white to full colour blueprints, we can scan & print your blueprints on the go. We can also laminate the blueprints to protect them from dirt and moisture. 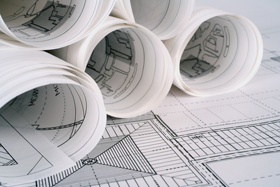 Ask us about printing your construction plans or blueprints on water-proof, tear-proof and weather-resistent paper. Just upload your file on our website and let us know ahead when you need them. Alternatively, if you already have hardcopy blueprints and need to copy them, we can scan and print you additional blueprint copies.